Sadly, the champs from our Chicago debut, Tomato Cocktail Club, were unable to make the scene, but they vow to return on December 6. That left the field wide open for several returning squads and a mess of newcomers. And the finale: Douchenozzle Apocalypse missed it by a mere half point (argh!). Some tough questions there, but Certified Organic (whose name was apparently riffing on Uncommon Ground's tasty, tasty menu) came out on top by knowing which mammal is the namesake of a Midwest NFL team and a far west Canadian Football League team. Sports nerds are still nerds. 2. 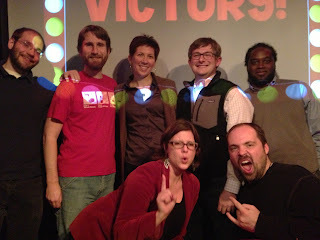 Co-heart: Featuring Northwestern Ph.D. students; came from behind thanks to a perfect Lightning Round score. But who cares—they won a Kindle! Thanks to some truly superior sponsors: Second City, the Chicago Filmmakers, the Annoyance Theater, and Graham Crackers Comics, which supplied absolute geek manna via Star Wars and Marvel Comics action figures (and we got more for next month!). Plus, our fantastic venue, Uncommon Ground. See you there again on December 6—we like this town.